With a goal of supporting and representing area climbers, the Minnesota Climbers Association is one of the main authorities on the sport of climbing in the state. In addition to mentoring new climbers, they work to connect experienced climbers and foster community. They also promote responsible stewardship and conservation of the areas in which they climb in hopes of paving the way for future generations of climbers. We connected with MCA board member Phaydara "Pi" Vongsavanthong to learn a little more about all that the organization does, as well as his favorite places to climb around Minnesota. 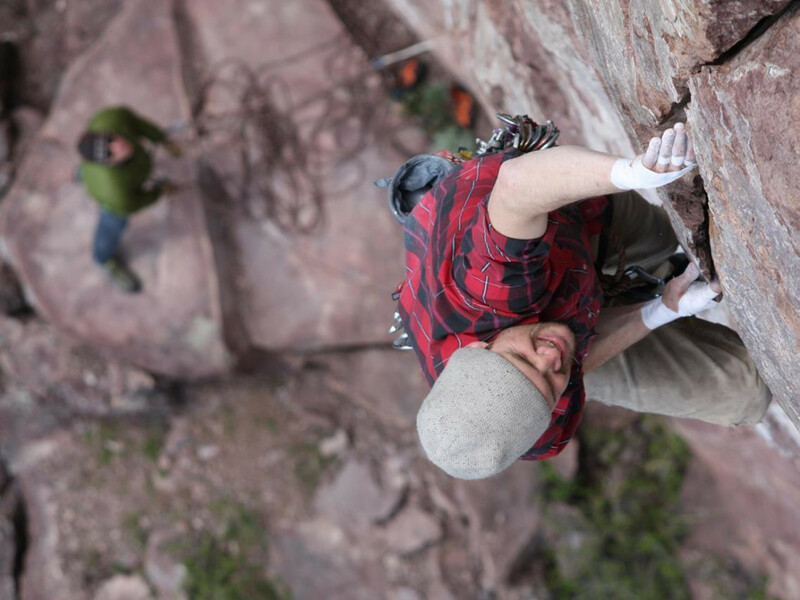 What makes Minnesota a good place to be a climber? The community. Minnesota is not known for having the best rock or the most rock, but everyone who leaves the Minnesota climbing community in search of those things comments about how unique our community is compared to wherever they have landed. We have ample climbing in Minnesota and have some great Midwest destinations within driving distance. Minnesota continues to have new climbing opportunities crop up and our relationships with state parks and forests keep growing and evolving. The best thing about being a Minnesota climber, however, remains the community. We know each other, care for one another, and hold our community in high regards. It's a great group of people to be a part of. Would you say the climbing community is growing in Minnesota? Are there specific disciplines that are gaining a bigger following? Yes, the climbing community is definitely growing. I would say sport climbing and bouldering are seeing an increase in participation mostly due to the availability of indoor climbing facilities. Both of these disciplines are the most accessible with respect to instruction and equipment. What are some major things you emphasize in terms of responsible climbing practices? Safety is paramount of course, but climbing “ethics” are also important to ensure a healthy relationship with the climbing community and sustainable partnerships with land managers. For the MCA, responsible fixed-anchor placement and maintenance/replacement is extremely important. We want to promote safe climbing, but at the same time, respect the importance of history and traditional climbing ethics. Rogue bolting only hurts access to our already limited climbing resources and create controversy in the community. That said, we do try to mentor those who reach out to us and we do support new route development (where appropriate). Overall, I'd say we want climbers to respect other differing styles of climbing and other user groups and be safe. What role does MCA and the climbing community play in terms of conservation and land stewardship? Our mission is to represent and support all disciplines of climbing throughout Minnesota and surrounding areas by advocating access for current and future generations, encouraging responsible climbing practices, promoting conservation, and stewardship of private and publicly held lands, as well as fostering communication and awareness of the sport to the public. Why are the state parks so important to the climbing community here? There are four different types of state owned lands that the MN DNR oversees. Of those four, state parks are protected for the purpose of recreating and getting closer to nature. That is exactly what climbers want to do. There are currently five parks that allow climbing. Originally there were three (Blue Mounds, Interstate, and Tettegouche). Then Temperance was opened up when the land that Carlton peak resides on was added. There was a history of climbing at Carlton. Similarly, Banning was opened to climbing when land that had a history of climbing was integrated into the state park. The MCA is working with the Minnesota DNR to open up John A. Latsch State Park by Winona. There is a significant amount of climbing potential at that state park. There are a handful of other state parks that have climbing potential that the MCA will work with the DNR to open up as well. Where are the best places to learn how to climb in the Twin Cities and beyond? Within the last few years, there’s been an insurgence of climbing facilities popping up. Midwest Mountaineering offers a free bouldering cave. Vertical Endeavors is a full service facility with locations in St. Paul and Minneapolis. The Minnesota Climbing Cooperative, a bouldering only facility, is one of the first climbing co-ops in the country located in Northeast Minneapolis. Another great resource for Minnesota climbers is the Twin Cities Rock Climbing Meetup group, who helps introduce new climbers and experienced climbers who are new to the area to the Minnesota climbing community. The University of Minnesota has outdoor trips (including rock and ice climbing) and an outdoor equipment rental program open to the general public. The most recent addition is the Midwest Climbing Academy, a youth-dedicated facility in Minneapolis. Where are some good places to climb that you’d recommend to beginners? Interstate Park in Taylors Falls, MN, is a great introduction to outdoor climbing offering top-roping, traditional climbing, and bouldering. Please register for a free climbing permit at the park office. Barn Bluff has a greater selection of sport climbing towering above Redwing, a classic Minnesota river town. Where are the best places for advanced climbers to climb in the state? 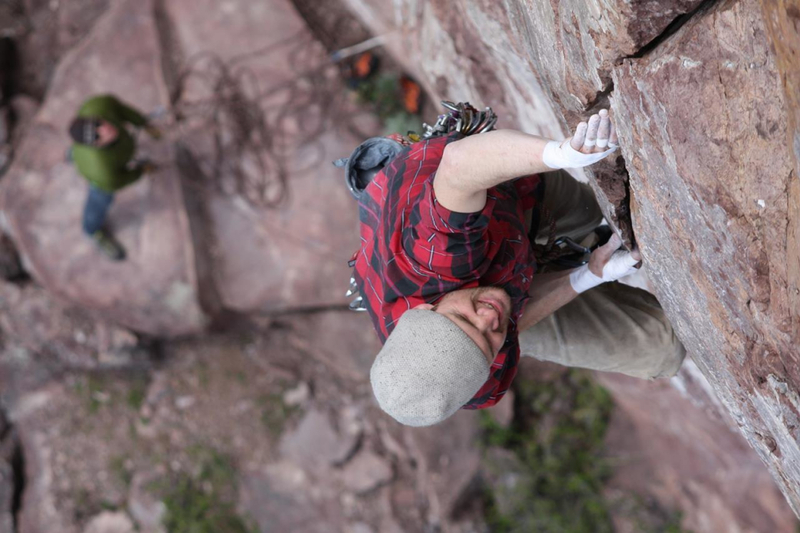 Sandstone, MN, is quickly becoming a destination for outdoor climbing. It’s located about 90 miles north of the Cities and conveniently on the way to even more climbing on the North Shore. The main attraction from the spring through fall months are sport climbing and bouldering, with trad options, too. Remember to watch out for ticks! While the long winter months are a welcome respite for ice climbing. The city has one of the largest ice farms in the Midwest tucked along the cliff lines of Robinson Park. Ice climbing is a huge attraction for Sandstone and the MCA has been working with the city to maintain the park since 2005. If climbing is not what you’re after, the Kettle River along the east end of Robinson Park is a popular kayaking destination. Is MCA working on any other initiatives that deserve a mention? Along with working with the DNR to open up more state parks to climbing, the MCA is working with the DNR to establish a policy on fixed anchors in state parks. The climbing management plan refers to a process to add fixed anchors. The process does not exist. The MCA wants to change that so sport routes can be added to some of the state parks that will be opened.